Is it safe? Obviously the test wasn’t designed to assess any possible negative cognitive effects, but apart from some, “skin tingling, itching, and mild burning sensations” the subjects tolerated frequent TES (transcranial electric stimulation) well. 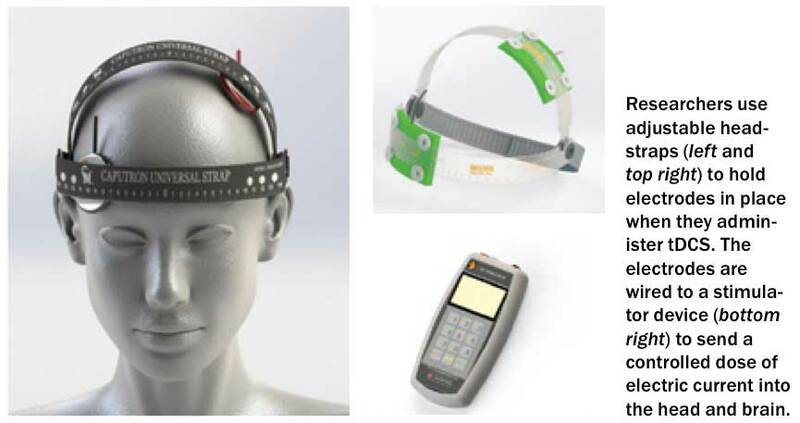 In the present study, we tested the tolerability (safety) and compliance, compared to sham, of two common tES approaches having a current density < 2 mA/cm2; transcranial Direct Current Stimulation (tDCS) or transcranial Pulsed Current Stimulation (tPCS) used by healthy subjects three to five days (17 – 20 minutes per day) per week for up to six weeks in a naturalistic environment. In this study 100 healthy subjects were randomized to one of three treatment groups: tDCS (n = 33), tPCS (n = 30), or sham (n = 37) and blinded to the treatment condition. The tES and sham waveforms were delivered through self-adhering electrodes on the right lateral forehead and back of the neck. We conducted 1905 treatment sessions (636 sham, 623 tDCS, and 646 tPCS sessions) on study volunteers over a six-week period. There were no serious adverse events in any treatment condition.